This GMC Sierra will steer all four wheels. 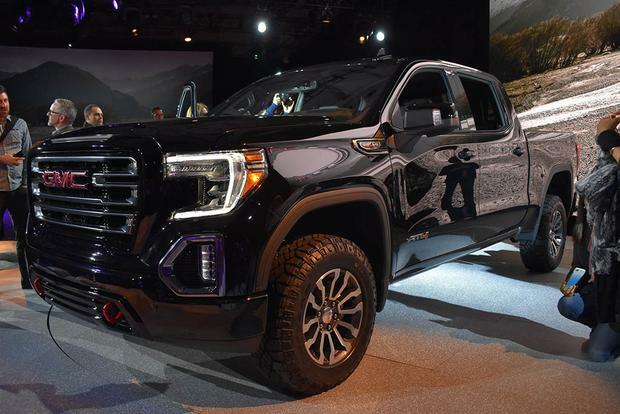 The 2019 GMC Sierra AT4 is the first member of the new AT4 off-road family. A job change has me criss-crossing the Midwest, and I wanted a luxurious and heavy vehicle without breaking the bank. Sierra is the answer. 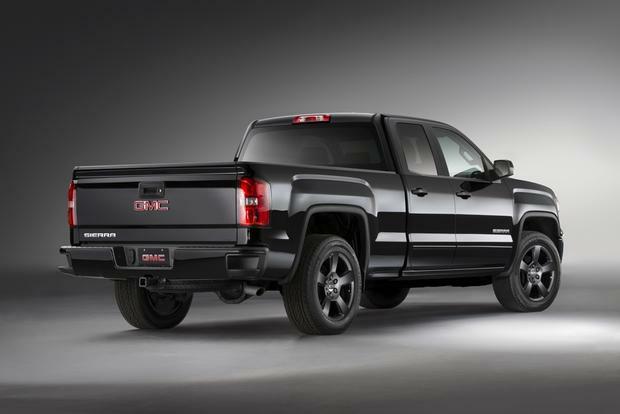 All new for the model year, the 2014 GMC Sierra 1500 pickup offers three cab styles, three bed lengths and three engines. The 2015 GMC Sierra is a full-size pickup that comes in a wide range of flavors -- from job-site workhorse to high-dollar luxury hauler. All new last year, the Sierra boasts an intimidating list of configurations, thanks to wide range of engine choices, trim levels, and cab or bed lengths. So what's it like? Well, for one thing, the styling is surprisingly similar to the outgoing Sierra model, which lasted from 2007 to 2013.Don't be fooled; the Sierra is totally new inside, under the skin and under the hood. It offers three new engines, a redesigned interior, and new features that range from a more compliant suspension to improved technology. But drivers who use the pickup for demanding work purposes shouldn't fear the updates, as the latest Sierra is still just as capable as it's ever been. 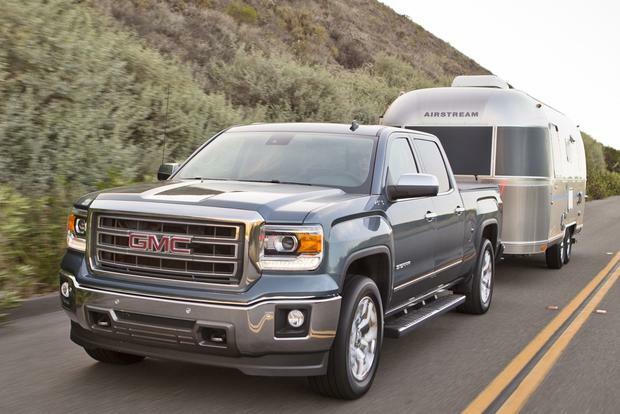 Despite a full redesign last year, the 2015 Sierra offers a few new updates, including a new OnStar system with a 4G LTE Wi-Fi hotspot and GM's impressive Magnetic Ride Control system for the upscale Sierra Denali. 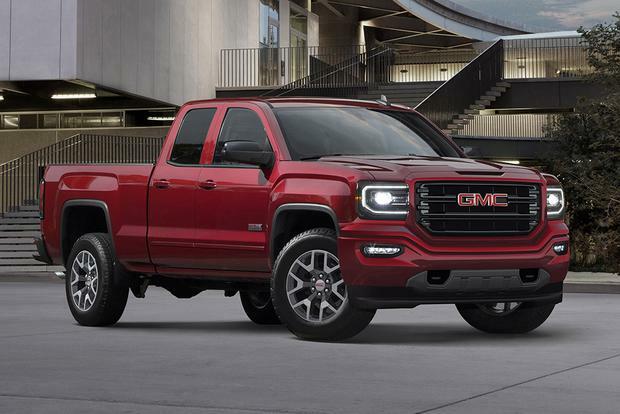 The 2015 GMC Sierra offers three engines: a 4.3-liter V6 that makes 285 horsepower and 305 lb-ft, a 5.3-liter V8 that makes 355 hp and 383 lb-ft, and a 6.2-liter V8 that makes 420 hp and 460 lb-ft. All Sierra models include a standard 6-speed automatic, though GM has hinted that an 8-speed might debut midyear for V8 powerplants. Not surprisingly, fuel economy is best with the 4.3-liter V6. That engine returns 18 miles per gallon in the city and 24 mpg on the highway with 2-wheel drive, or 17 mpg city/22 mpg hwy with 4-wheel drive. Pick the 5.3-iter V8, and you'll find that fuel economy doesn't drop as much as you might think. The Environmental Protection Agency rates that engine at 16 mpg city/23 mpg hwy with 2-wheel drive, or 16 mpg city/22 mpg hwy with 4-wheel drive. Topping the range is the mighty 6.2-liter, which returns 15 mpg city/21 mpg hwy with 2-wheel drive, or 14 mpg city/20 mpg hwy with 4-wheel drive. 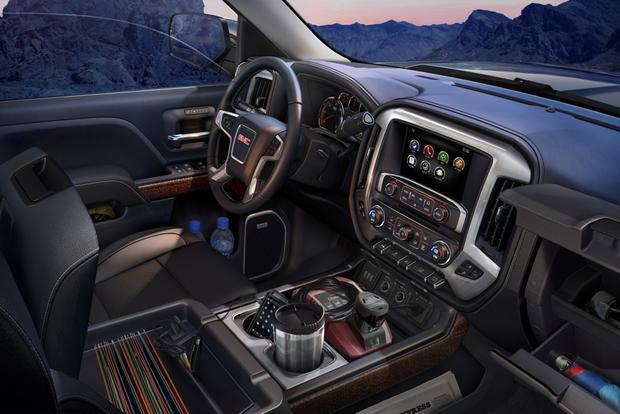 Like all full-size pickups (and its Silverado sibling), the Sierra comes with a wide array of choices that include bed size and cab preference, drivetrain, engine, and trim level. We've simplified things and organized the truck's features by trim level, but choosing the right Sierra for you will likely involve more than simply picking a trim. If you go with a base-level Sierra ($27,500), you'll be stuck, as you might expect, with the basics. That means power locks, cruise control, air conditioning and an AM/FM stereo -- but no simple conveniences such as keyless entry or power windows. With that said, base-level Sierra models do include a USB port and an auxiliary jack. Next up is the SLE ($33,900), which adds all the base model's missing luxuries (keyless entry, power windows, SiriusXM satellite radio, a CD player) and a few more goodies. Such items include GMC's IntelliLink infotainment system, a backup camera, LED lighting in the bed, and a few miscellaneous appearance items. 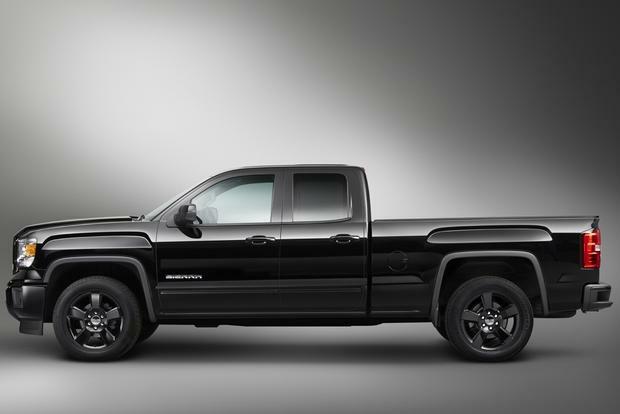 Next up is the Sierra SLT ($41,200), which is offered only as a double cab or crew cab pickup. The SLT offers a long list of standard features, including leather upholstery, dual power front seats, heated mirrors and a locking rear differential. SLT models also come standard with the Sierra's 5.3-liter V8, while base and SLE models offer it as an option. Topping the Sierra lineup is the Denali ($50,700), which only comes in crew cab form and includes the pickup's 6.2-liter V8 engine as standard equipment. Denali models include a long list of standard features, from chrome accents and leather seats to a heated steering wheel and an upscale Bose surround sound system. As for options, the Sierra has several. Extras include a power sunroof, a navigation system, cooled seats, power adjustable pedals, and 4-wheel drive. Additionally, drivers can add safety features such as forward-collision alert and a lane-departure warning system. 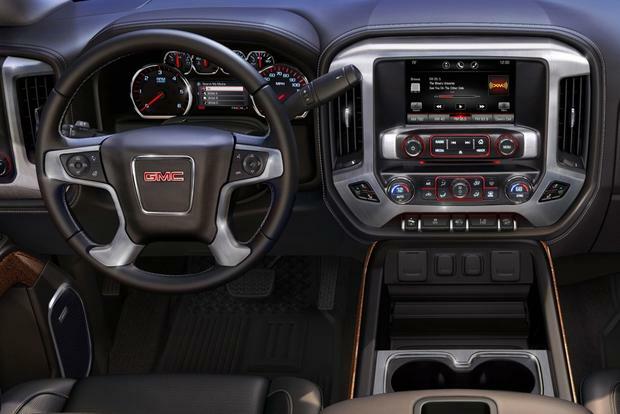 All GMC Sierra pickups include dual front airbags, front-side airbags, side-curtain airbags, daytime running lights and a tire pressure monitor. Options include a lane-departure warning system, a forward-collision alert system and GM's OnStar system, which can call for help if there's an accident. 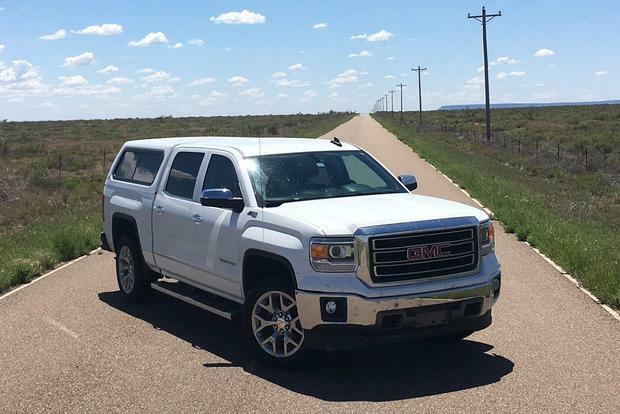 In the National Highway Traffic Safety Administration's testing, the GMC Sierra and its twin, the Chevrolet Silverado, earned perfect 5-star overall crash-test scores -- and were the first full-size trucks to do so. There's absolutely no doubt that the Sierra rides and handles better than the old model did. That's largely due to its new fully boxed frame, which clearly makes the truck feel more rigid and stable than last year's model did. It also helps with towing, as do the fully integrated trailer brakes. We also couldn't live without tow/haul mode, which takes the guesswork out of manually operating the automatic transmission when you'd rather be focusing on things such as guiding the pickup safely up a hill. We were further impressed with the Sierra's interior. One major plus is its center-mounted, 8-inch LCD screen, which is positioned perfectly so you don't have to take your eyes far off the road to use it. The same is true of the LCD screen that's mounted in the gauge cluster. It's far better than the Sierra's former pixelated display. We also enjoyed the huge sunroof, though wind noise got a little loud. We also loved the Sierra's gadgets. Compared to just a few short years ago, it's hard to believe a truck now has USB ports, navigation, in-vehicle apps, and a center-mounted touchscreen. The only gadget we didn't enjoy was the voice control system, which we had trouble using for both navigation and audio functions. Ford F-150 -- The all-new Ford F-150 is close competition for the Sierra and Silverado, boasting excellent fuel economy, high-strength towing and payload capacities, and a heavily modernized interior. RAM 1500 -- Formerly the Dodge RAM, the RAM 1500 offers available air suspension and famous HEMI V8 power. There's still no other light-duty pickup with an available diesel engine. Toyota Tundra -- The Tundra is refined and muscular, offering a strong rival to the Sierra, but the Tundra still can't trump the Sierra's wide range of bed, cab, and engine configurations. 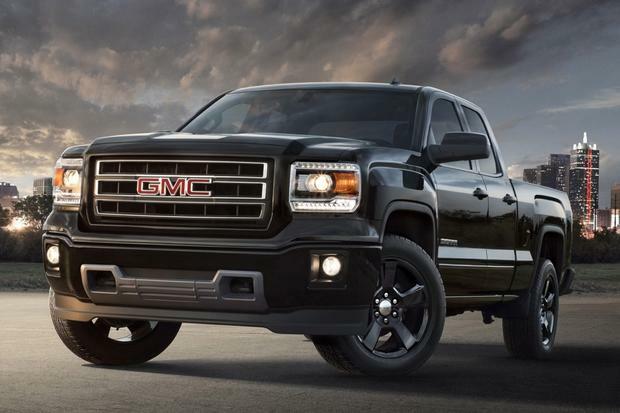 Assuming that you pick the model that works for your lifestyle, you can't go wrong with any 2015 Sierra. With that said, we don't suggest the base-level Sierra if you're the kind of driver who enjoys gadgets, and we don't suggest the Denali if you're going to visit dirty job sites or rutted country roads. Our dream Sierra is probably a Sierra SLT or a well-equipped Sierra SLE -- though we certainly wouldn't turn down the Sierra Denali if we had the cash.